Most of the hunters (academic researchers) searching for consensus in their Delphi research, are new to the sport. They believe that they must bag really big game or come home empty handed. But we don’t agree. In fact, once you have had a chance to experience Delphi hunting once or twice, your perception of the game changes. Consensus. The consensus process – getting teams of experts to think through complex problems and come up with the best solutions – is critical to effective teamwork and to the Delphi process. In most cases, however, it is not necessary – or even desirable – to come up with the one and only best solution. So long as there is no confusion about the facts and the issues, forcing a consensus when there is none is counter-productive (Fink, Kosecoff, Chassin & Brook, 1984; Hall, 2009, pp. 20-21). Table 1 shows the general characteristics of various types of nominal group study techniques (Hall & Jordan, 2013, p. 106). Note that the so called traditional Delphi Technique and the UCLA-RAND appropriateness approaches aim for consensus. The so call Modified Delphi might not search for consensus and might not utilize experts. Researchers use the UCLA-RAND approach extensively to look for the best medial treatment protocol when only limited data is available, relying heavily on the expertise of the doctors involved to suggest – sometimes based on their best and informed guess – what protocol might work best. The doctors can only recommend one protocol. Consensus is needed here. (Table reprinted with permission Hall and Jordan (2013), p. 106). But consensus is rarely needed, although it is usually found, to some degree, in business research, and even in most academic research. For example, the most important factors may be best business practices. Of the total list of 10 to 30 factors, few are MOST important. Often, the second round of Delphi aims to prioritize those qualitative factors identified in round 1. There factors are usually natural separation points between the most important (e.g. 4.5 out of 5), those that are medium important (3 out of 5), and the low importance factors. This brings us to qualitative Delphi vs. a more quantitative, mixed-method, Delphi. Usually Delphi is considered QUAL for several reasons. It works with a small number of informed, or expert, panelists. It usually gathers qualitative information in round 1. However, the qualitative responses are prioritized and/or ranked and/or correlated in round 2, round 3, etc. If a larger sample of participants results in 30 or more respondents in round 2, then the study probably should be upgraded from a purely qualitative study to mixed-method. That is, if the level of quantitative information gathered in round 2 is sufficient, statistical analysis can be meaningfully applied. Then you would look for statistical results (central tendency, dispersion, and maybe even correlation). You will find a confidence interval for all of your factors, those that are very important (say 8 or higher out of 10, +/- 1.5) and those that aren’t important. In this way, you could find those factors that are both important and statistically more important than other factors: a great time to declare a “consensus” victory. TIP: Consider using more detailed scales. As 5-point Likert-type scale will not provide the same statistical detail as a 7-point, 10-point or maybe even a ratio 100% scale if it makes sense. Subsequently, in the big game hunt for consensus, most hunters continue to look for the long-extinct woolly mammoth. Maybe they should “modify” their Delphi game for an easier search for success instead . . .
Hall, E. B., & Jordan, E. A. (2013). Strategic and scenario planning using Delphi: Long-term and rapid planning utilizing the genius of crowds. In C. A. Lentz (Ed. ), The refractive thinker: Vol. II. Research methodology (3rd ed.). (pp. 103-123) Las Vegas, NV: The Refractive Thinker® Press. A single round (1 round) Delphi study. How can that be? The 2007 Lentz Dissertation by Cheryl Lentz (Dr Cheryl) was interesting in many ways. One is that it was a single round study. What she was doing was following on research that had been conducted previously. So she was able to use the prior research for the information and the factors that she would have needed to gather in round 1 of a full Delphi study. I know, I know. That’s not a Delphi study then if only 1 round. But she chose to still call it a Modified Delphi, study in large part, because of the use of experts. She recruited HR experts to do the study. The results turned out to be a bit of a conundrum, as she discussed in her 2009 article in the Refractive Thinker. But that’s another post discussion. There are several ways to change a Delphi study from the classical approach used by RAND back in the cold war era, and therefore to categorize it as a “modified” Delphi study. One way is to use informed people, so that you avoid having to get “experts” to participate. Plus then you would have to justify the criteria used to decide what represents and expert. Another approach is not necessarily to aim for consensus. Most studies using Delphi don’t need full consensus; often they are aiming for best practices or the most important factors. 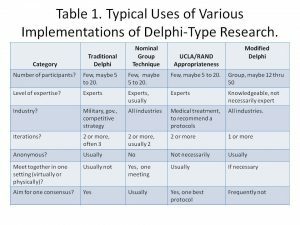 The UCLA/Delphi approach is used to get medical experts to decide on a single best protocol for treatment (in the absence of conclusive laboratory research). In this case, they do need to aim for consensus. Without enough evidence and experience, no medical protocol should be recommended at all. So, with all that said, do you think that Dr Lentz’s dissertation with only one round (essentially a second round) should have been categorized as a Delphi study? Hall (2009) presents a table that summarizes the various categories between/among types of nominal studies. See the next blog post here related to the conundrum of the findings in this research study. Lentz, C. A. (2007). Strategic decision making in organizational performance: A quantitative study of employee inclusiveness. D.M. dissertation, University of Phoenix, Arizona. Dissertations & Theses @ University of Phoenix database. (Publication No. AAT 3277192).